MUMBAI: Powerpuff mania is set to engulf kids across India. Cartoon Network has unleashed the 'Join the Powerpuff Generation' campaign in its quest to find television hosts for new episodes of a globally popular Cartoon Network show, which will be launched later this year. The channel has been around for the last 10 years but incidentally, this is the first time ever that kids will host a show something on Cartoon Network. The channel is on the lookout for kids oozing with confidence, creativity, onscreen presence, and more importantly they should have a funny bone in them. Reliance Web World has been roped in as a real broadband partner. Whilst out of the sixteen cities that the channel will audition kids from; four (Delhi - 20 & 21 August, Mumbai - 13 & 14 August, Kolkata 6 & 7 August and Bangalore - 30 & 31 July) will have ground auditions and the kids from the rest 12 cities (Hyderabad, Cochin, Chennai, Coimbatore, Amravati, Kolhapur, Ahmedabad, Surat, Vijaywada, Allahabad, Jaipur and Amritsar) will give their auditions through the Reliance Web Worlds' video conference in their cities. Judges will interact live and audition the kids from Mumbai's Reliance Web Worlds. This is the first time that any kids' network will be using virtual technology. In the end, six kids (three boys and three girls) in the age group 7 - 14 will be chosen and will get an opportunity to host a show on Cartoon Network. 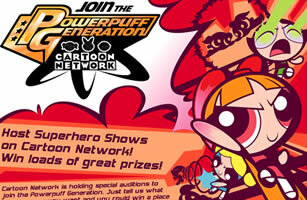 "Join The Powerpuff Generation is one of the key Cartoon Network marketing initiatives for the year 2005. As the number one kids' channel of India, we are constantly raising the industry bar and evolving our strategies to accommodate the changing needs of Indian kids. This innovative marketing initiative will add another dimension that will set standards with its effective roll out using cutting edge technology - by introducing the concept of virtual auditions. These will ensure that no matter where they are, kids can participate in join the Powerpuff Generation through virtual auditions," said Cartoon Network and POGO director marketing Vivek Krishnani. 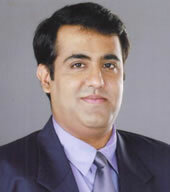 Reliance WebWorld marketing head Sunil Buch said, "The superpower of Cartoon Network has joined hands with the superpower of Reliance Infocomm because of the great synergy between Cartoon Network's target audience and Reliance Web World Real Broadband applications and product offerings. These include applications like Multiplayer Online Coming and products like Digital Parties, Little Genius and Digital Imaging. As their Real Broadband partner we are not only providing an all India retail network of new age digital outlets for promoting and inviting registrations from new age kids but also offer a unique opportunity to host auditions in remote locations using the video conferencing facility at Reliance Web World." Starting 27 June, kids can enter the contest by submitting an entry form describing, "Which Super Power They Want" The entry forms can be downloaded from the channel's website - www.cartoonnetworkindia.com or collected from any Reliance Web World outlets. The entry forms will also be distributed through a six city school contact programme, reaching more than 350,000 children from over 450 schools. The last date for entries is 31 July, 2005. From the entries received, 1000 kids each will be auditioned in Delhi, Mumbai, Kolkata and Bangalore between 30 July and 26 August. In addition, 50 children each will be selected from the other 12 cities. The short listed contestants will be called for virtual auditions in their respective cities from 1 - 21 August. The channel has roped in Cadbury and Camlin as the presenting sponsors for 'Join The Powerpuff Generation', whereas Kissan, Reynolds, Parrys, Parle G, Horlicks and Kelloggs are the co sponsors. Krishnani said that the event will be backed by on-air, online, on-ground and off-air promotions, thus creating multiple touch points for kids. "Our promise is to reach out to the maximum number of kids and give them an opportunity to be a part of this mega initiative. We are reaching them through our network, which has a presence in 22 million households, through school contact activities and through our off air communication which will touch almost five million kids through kids magazines and supplements. The promotional activities will run through out the next couple of months until the show goes on air. Also our branding presence will be there across all Reliance Web World outlets." Queried as to when the new show with the six kids as hosts was likely to go on air, Krishnani informs, "The auditions will finish by the third week of August and by the first week of September we will have our winners' shortlist. So immediately thereafter, we will get on to the network with the shows." Cartoon Network enjoyed a good run this summer, wherein the channel aired the Harry Potter movies and other shows on the 'Thunda Funda' block. Cartoon Network and Pogo, at present account for 82 per cent of the kids' pie. "As the market keeps growing, with competition coming in, we will be doing different and innovative things and raising the industry bar to try and carve out a larger share of the pie."